Gender-based wage disparity continues. The good news: it’s narrowing a bit. Noted Allard, “Although the overall average salary for male graduates was 12.6% higher than that for females, this differential is about six percentage points lower than in 2016.” An outlier here is the Mountain region, where female salaries outpaced males’ by 9.2%. On the other end of the spectrum, nonprofits reflected the greatest wage disparity, with male graduates out-earning their female counterparts by an average of 17.2% in starting salaries. Region matters – sort of. Average starting salaries were highest in the Pacific ($67,712) and lowest in the Southeast ($47,428), with the Northeast at $52,375, South Central at $49,040, Midwest at $51,205, Mountain at $49,532, and Canadian/International at $49,900. Interestingly, if the Pacific region is removed from the equation, this is a fairly tight cluster of salary ranges. Alternative LIS settings may pay well. The survey results included data for Government Library placements (3% of job seekers, averaging salaries of $55,285), Private Industry (13% of graduates, with average starting salaries of $78,094), and Special Libraries (3% of job seekers, with relatively lower average salaries for this group at $49,546). Allard clarifies that for the purposes of the survey, Special Libraries include medical, art, historical, industrial or corporate, nonacademic museum, and “other.” One might extrapolate from this that the category of Private Industry, then, refers to LIS professionals who are using their information skills in roles not associated with working in a formal, centralized organization library or information center. As LIS roles expand, so do titles. Allard noted that some of the most unique titles were Cloud Consultant, Discovery Librarian, Creative Technologies Librarian, Data Indexer, Digital Forensics Lab Assistant, e-Content Analyst, and Data Analytics & Visualization Librarian, among others. The major take-away for job-seekers here is to be highly flexible when considering which terms to deploy when searching job sites. The report further noted many new ways information skills were being repurposed to address new information needs, such as managing technology for user experience testing and artificial intelligence. Employment trends are generally encouraging. Some 85% of grads landed full-time positions, a slight increase over 2016 numbers. Only 15% of respondents took part-time positions, a 50% decrease from just two years earlier. Whereas 7% of 2016 grads remained unemployed at the time of last year’s report, this number had dropped to 6% for 2017’s grads. 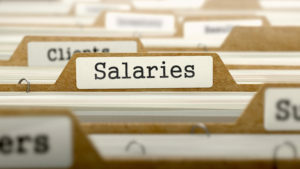 Their average full-time starting salary is only slightly higher (1%) than the previous year, but as Allard points out, the trend continues to move upward, with a total 17% increase over the past six years. First, although the LIS job market will be competitive for the foreseeable future, the profession seems to be doing a solid job of absorbing most job-seekers if these survey results can be extrapolated to the broader LIS job market. Second, however, every “edge” will continue to help when applying for jobs. Build a strong network of professional connections who can help by alerting you to job openings before they go public. Make sure you have at least some professional visibility, whether by volunteering for LIS projects, participating in relevant LIS associations, creating an event or program (especially as a student) that you can lead, speaking at conferences, writing for online publications, or similar types of activities. Third, you don’t need to be a social media maven, but a strong and informative LinkedIn profile is a must-have so potential hiring managers can check you out before deciding whether to interview you. In addition, if you have the time and inclination, a simple website that allows you to showcase your best work can be a great way to demonstrate your value to future employers. Lastly, consider your priorities based on these survey results. For example, if your dream career is archives, you need to accept the fact that archives jobs paid new grads substantially less than other types of LIS work and the jobs may often be temporary (according to the report, 46% of the 2017 archives positions fell into this category). Neither of these facts are reasons to forego becoming an archivist (or any other type of LIS professional), but they’re simple circumstances to be aware of. Alternatively, if you’d like to work in a government library but one with the highest possible salary, you’ll want to consider living in the Southeast, Mountain, or South Central regions where pay is anywhere from 16% to 21% higher than average. This may necessitate moving to a different part of the country. Again, simply additional “input” for making your job decisions. In fact, that’s the great thing about a report like this – it gives you solid data with which to make the career decisions that best reflect your own preferences and priorities. And although this brief recap has touched on some of the report’s key points, I’d highly recommend taking a look at the entire analysis if you have access to Library Journal’s October 15th print issue. Alternatively, you can access the report via one of the online LIS databases or via the LJ website, although the online report is now (unfortunately) behind a paywall. And last but definitely not least, a note of thanks and congratulations to Dr. Suzy Allard for her research, analysis, and summarized insights in this Placements & Salaries report. It’s incredibly important information for the profession. You rock, Suzy!